A mail service is the fastest & most reliable way to get packages in Panama. I don’t know about you, but I love to order things online. It makes shopping so much easier. You can still order things online while in Panama. But it will cost more and take longer for those things to get to you. When I am in the States and I order something in the morning from Amazon Prime, sometimes it arrives later that same day. I am still amazed by that. But, you won’t experience such quick delivery when ordering online while in Panama. This is one of a 4 part, Mail in Panama, series. 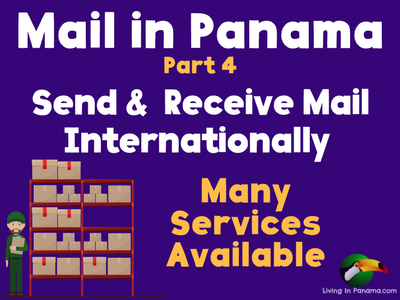 This is Part 4 – Get & Send Mail in Panama. I also cover alternative ways to mail letters and send faxes. Also see, Part 1 – What To Do About Your Current Mail, Part 2 – Postal Service in Panama, and Part 3 – Domestic Mail in Panama. There are a number of ways to send a package to Panama. I am sure you could also use the Postal service of most countries to send mail to Panama. However, I am only familiar with the US Postal Service so that is the only public postal service I discuss here. Parcel shipping or forwarding services allow you to purchase from an online retailer, and have the products shipped to a USA address. The shipper will then consolidate the packages and ship them to you in Panama. The majority of expats in Panama use one of these private mail services. There are a number of mail services to choose from. I reviewed mailing service recommendations on various Panama-related forums. I have listed ones that get good overall comments below. I don’t recommend one over another. FYI – Pty stands for Panama City. That “abbreviation” comes from the airport code for Panama City’s Tocumen International Airport (PTY). Air Facility Pty – Has 2 locations in Panama City and will deliver to all provinces by one of Panama’s delivery services. Some people say that it is less expensive per pound than some others. Mailbox Express – Overall MBE, seems to be used by the majority of expats in Panama. People also claim it is more expensive than other services. It is a franchise business. So get to know the one in your area. Service can vary from location to location. Hot Express – Hot Express is owned by Uno Express. This means that the Uno Express delivery portion of your package’s journey is essentially free. I know people who are very happy with Hot Express. The Box Shop – Located in David. The owner, Dario Samudio, speaks excellent English. It appears to be reasonably priced. Not everyone has had good experiences using the US Postal Service to send letters and packages to Panama. Packages. We have had a very good experience with packages sent by USPS. For years, my kids received regular birthday, Easter and Christmas packages from their grandparents here in Panama. Every package arrived, sooner or later. Sometimes even quickly (think 2 weeks). Unfortunately, once a few postal workers in David rifled through and stole from all the packages waiting to be picked up at that post office. This meant that my youngest daughter did not get her grandmother’s birthday gifts that year. Very disappointing for both parties. I was pleasantly surprised that in response to this theft, the David post office fired a number of workers and completely changed their process for packages. I don’t believe such a theft has happened again. Magazines. We have not had much luck with magazines sent by US Postal Service though. Some arrive, and some don’t. My husband a a newspaper delivered from Spain, and it almost never arrived. However, it “envelope” was a simple paper band around the paper, easily ripped and destroyed. Letters. We have had pretty good track record getting letters from the US via the USPS. To increase your odds, it is best to sent it in one of those big cardboard priority mail envelopes. The size and visibility seems to give it less chance of getting lost. What Address To Give USPS. As I mentioned in Mail in Panama – Part 2, the Panama mail service has no door-to-door mail delivery. You need to direct your package or mail to correctly to increase its chances of arriving as quickly as possible. Find out what address to use for mail in Panama. There are other ways to get a letter sent or faxed to anywhere you desire. Here are some of your options. DHL – The best way to get a time critical document to the USA (or anywhere) in Panama is by DHL. For some reason DHL is more reliable in Panama than FedEx is. It isn’t cheap, but it is fast and reliable. There are DHL office in many locations throughout Panama. If you go to the Boquete Tuesday market, there is a service there from which you can buy USA stamps. They forward the mail to the USA to be mailed. Not for use for urgent mail. You can email your letter to an online mailing service. They print it out and mail it anywhere you want it to go in the world. You can send it certified mail, over-night, and more. The return address is the service’s, so if something is returned they will follow up on the issue. There are services that will fax for you as well. You email them your document, they print it and fax it. eFax – will fax your email attachment. You can also use the efax app on your smartphone. I am sure there are other services as well, if your really need to fax. Do you really need to fax? Moving to Panama? You may want to use our Move To Panama Checklist.